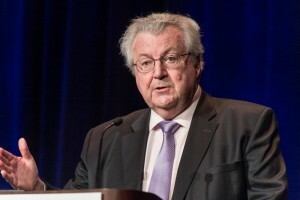 In a short talk to the attendees of the NAPE business conference, the former president of Shell Oil Company, John Hofmeister, shared his perspective on the current regulatory and political environment and encouraged participants to take leadership. Hofmeister gave a brief update on what he sees as a crisis in the energy sector, citing the massive shutdowns of coal plants and the U.S. neglect of nuclear power sources. He also highlighted our inability to keep up and believes we cannot meet global oil demand by 2020. He reminded participants that the world will use more, not less, energy and that the post industrial electronic age brings more demand than ever. Hofmeister laid much of the blame squarely at the feet of the legislature, claiming that the regulatory burden is too high and insisting that someone must provide leadership and look out for the public interest. During much of the speech, he took on the fervor of a political candidate as he called on the energy guardians to “lift the game” to renovate, expand, build and change the current political climate that is hampering growth.